The holiday season seems to carry with it the message of hope, and of finding the best side of who we are. So one of the gifts that I'm going to unwrap with you is a replay of a conversation that I had earlier this year, with 2 people who epitomize hope, humanity, and love. To me, that's what the holiday is all about, and that's what Dan and Jennifer Digmann are all about. 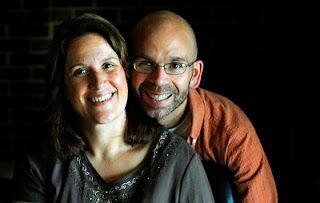 Jennifer was diagnosed with Progressive MS in 1997, and Dan was diagnosed with relapsing-remitting MS in 2000. Dan & Jennifer met at a National MS Society event in 2002, and they were married in 2005. We'll get Dan and Jennifer's thoughts about what life is like when both partners in a marriage have been diagnosed with multiple sclerosis. We'll also tell you about the research team that may have identified a biomarker for MS (and why that's a very good thing!). We'll share the results of the Phase III clinical trial data analysis that demonstrates that treatment with Ampyra improves walking ability for people living with MS, we'll tell you about the FDA approval of a Phase II clinical trial for a novel stem cell therapy, and you'll hear about the clinical trial that's about to begin for a new cannabinoid-enriched tablet that can help manage MS pain and spasticity.